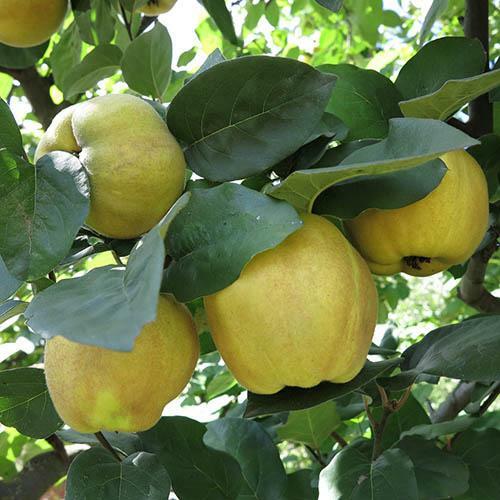 We've unearthed a little gem here for you, the perfect patio fruit tree for smaller gardens. In fact it's breeder, renowned British fruit grower Will Sibley, thinks it's the best patio fruit tree you can grow! Quinces have fallen out of favour - and perhaps out of flavour too. Yet their sweet fruit make great jellies, jams, and sauces, and they have the most beautiful pink blossom too. Hardy and self-fertile, it really is an easy winner. This little beauty is destined to stay small, so works well in a big pot on the patio or terrace. The variety itself is naturally compact, and has been grafted onto a very dwarfing rootstock Will found in the former Soviet Union!! After 3 low maintenance years, you should get up to 50 tennis ball sized sweet yellow fruit each Summer - dig out those recipes and enjoy old-fashioned Quinces once again. Supplied as a grafted tree in a 4.5L pot, about 80cm tall. Dormant in Winter.